Freshpet's Select Grain Free Tender Chicken with Potato and Spinach is Ru's new favorite food. This food comes as a refrigerated roll with the portions labeled right on the wrapper. It is unusual because it is perishable but not frozen. There's no need to defrost, and it's convenient because the portions are market right on the wrapper. Freshpet is relatively new to the pet food market, as is the entire concept of refrigerated food. In order to enter the market, Freshpet had to convince retailers to add an actual refrigerated display, as well as take the risk of selling perishable pet food. They've succeeded, but the company has definitely had a lot of help. Tyson Foods is a major investor and distribution partner. Giant faceless corporation MidOcean Partners also owns a significant portion of the company and board of directors, so it's worth mentioning that they are likely to prioritize shareholders over customers. 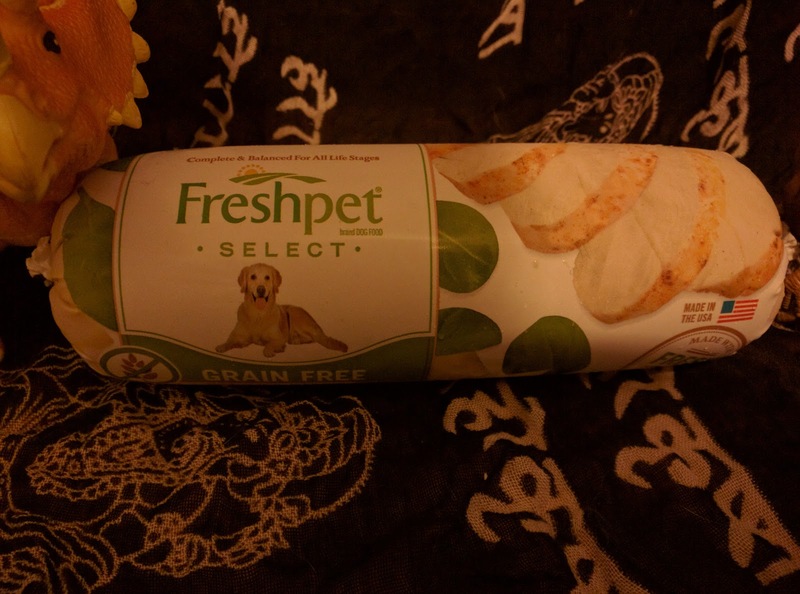 Freshpet has never had a recall to date, however they probably ought to have last year. Social media was abuzz with pictures of moldy Fresh Pet, mostly the kibble-sized bits sold in bags. The company's first response was that the bags had been stored improperly or damaged. I haven't seen anything from 2016 so hopefully they've resolved whatever issue they had. Still, it's also worth noting that they chose to prioritize their claim of no recalls over the health of customer pets from a known and very widely-documented issue. This feels like a weird combination of Natural Balance dog food rolls and pre-made frozen raw dog food. It's not shelf stable, but I don't have to freeze it either. It actually smells rather appetizing, and I'm pretty sure I could get some of my coworkers to taste it. There are visible chunks of potato in there, but mostly it looks like the result of tossing chicken and spinach into a blender. The side of the roll is market by the half cup. The log holds together very nicely for slicing, and needs to be mooshed up with a fork for tiny dogs who lack ambition. This food is rated five out of five stars on the Dog Food Advisor website. I used to only feed my dogs once a day, but with Brisbane's health issues I had started feeding him breakfast as well as dinner. Sisci also appreciated getting half her daily ration in the morning, and I felt like Ru was getting left out. Then I went to Target and impulse-bought a roll of Freshpet. Ru looooooves this food. He's usually pretty ambivalent about food in general, so it's weird to see him acting a bit like a regular dog. 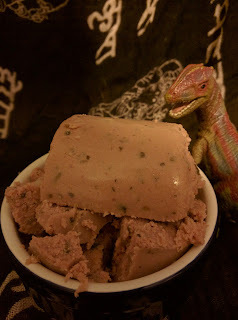 Sisci also loves the food, and it works well as a kibble topper for dog-sized dogs. I could probably slice some of it up to use as training treats. Freshpet says to treat their food like deli meats, so they shouldn't be left out for hours. They will also start to smell funky if you leave them opened in the fridge for more than a week, so plan to use the food up ASAP. The company is active on social media and seems to have great customer service, so I will let them know if I ever run across any mold. I just found out they have an egg-free beef and bison roll that Brisbane might like as he's recovering for surgery, hopefully somewhere local carries it.